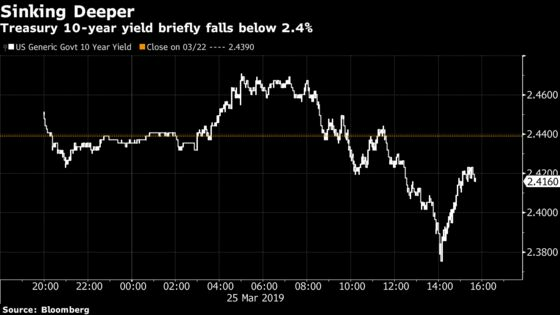 A rally in Treasuries sent benchmark yields briefly below 2.4 percent for the first time since December 2017. Stocks were mixed and the dollar retreated. Technology shares led losses in the S&P 500 Index as Apple Inc. slumped during Chief Executive Officer Tim Cook’s address. Consumer discretionary and industrial companies gained. Treasury 10-year yields extended their slide into a second day as investors wager the Federal Reserve will need to cut rates amid an economic slowdown. The pound turned lower after Prime Minister Theresa May stumped for her Brexit deal before a parliamentary vote. Traders pushed down the value of risk assets amid mounting concern over a global downturn and after stock valuations climbed near levels reached during the height of last year’s euphoria. The Fed may have to put rate hikes on hold or even ease monetary policy if economic forecasts for 2019 disappoint, Chicago Fed President Charles Evans said. Investors also digested news that Special Counsel Robert Mueller found no evidence anyone close to Donald Trump colluded with Russia in the 2016 presidential campaign. The pound retreated as May said she doesn’t yet have enough support to put her Brexit deal to a vote in Parliament. As lawmakers try to take control of the process, she’s wielding the threat of a long extension if her deal isn’t passed. European shares dropped even after data showed confidence among German companies improved. Australia’s 10-year bond yield recorded an all-time low and Japan’s hit the lowest since September 2016. The Turkish lira recouped some of its Friday slump. U.S.-China trade talks resume, with a cabinet-level American delegation due in China. U.K. Parliament is likely to stage several key votes on Brexit. China’s Boao Forum for Asia holds its annual conference this week. A top Chinese government leader will deliver a keynote speech, and officials including Central Bank Governor Yi Gang and Finance Minister Liu Kun are scheduled to speak. The S&P 500 Index fell 0.1 percent to 2,798.39 at 4 p.m. in New York. The Dow Jones Industrial Average added 0.1 percent, while the Nasdaq-100 Index dropped 0.1 percent. The Stoxx Europe 600 Index decreased 0.5 percent. The MSCI Asia Pacific Index declined 1.9 percent. The Bloomberg Dollar Spot Index fell 0.1 percent. The euro increased 0.1 percent to $1.1314. The British pound decreased 0.1 percent to $1.3196. The Japanese yen dipped 0.1 percent to 110 per dollar. The yield on 10-year Treasuries dipped three basis points to 2.41 percent. Germany’s 10-year yield fell one basis point to -0.03 percent. Britain’s 10-year yield decreased three basis points to 0.986 percent. The Bloomberg Commodity Index increased 0.2 percent. West Texas Intermediate crude dipped to $58.82 a barrel. Gold posted a fifth straight gain as the dollar weakened.